As Swimming Canada works towards its mission to be one of the leading swimming nations by 2020, one of its main goals is to enhance the development of world-leading high performance coaches. The Apprentice Coach opportunity will allow selected Canadian coaches to gain international experience and further their professional development by being part of and working with Swimming Canada’s four National Teams. 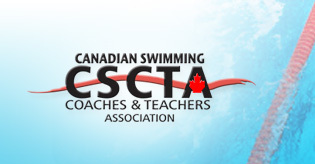 “The CSCTA are excited to partner with Swimming Canada to expand the existing National Development Team apprenticeship program to now include the Senior, Para, and Open Water programs. These programs will offer real world international experience for Canadian coaches as part of the national team programs and continues to further expand on our available professional development opportunities,” said Chris Hindmarch-Watson, executive director of the CSCTA.